While the common thinking is that American businesses have to go overseas to get their products made, the Manufacturing Solutions Center (MSC) in Conover, N.C., has been connecting entrepreneurs with domestic manufacturers in nearly every state since 1990. Originally called the Hosiery Technology Center, the organization changed its name four years ago to reflect its wide range of services, from prototyping to applied R&D, and the varying industries it assists. Although "hosiery" is no longer in the name, MSC is still an expert in the manufacturing of textiles, as well as many other types of products. The center is a one-stop shop for inventors and designers who need help getting their ideas through production and into consumers' hands. Executive director Dan St. Louis told us more. 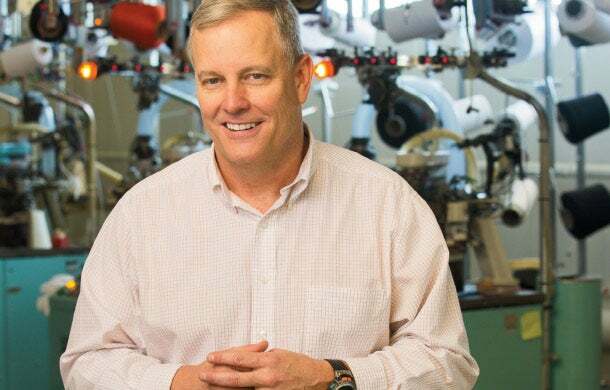 Stitching together relationships: Dan St. Louis of Manufacturing Solutions Center. What's the advantage of partnering with domestic manufacturers? There are great manufacturers all over the world, but the American public saw how it hurt the economy when some of our manufacturing jobs went overseas. These days domestic manufacturing is just practical. It's easier to control production when you work directly with someone on the same continent, a short drive or plane ride away. Also, the minimum orders are less. You don't have to fill a shipping container or wait six months for your product to arrive. What do you provide in terms of product testing and prototyping for startups? We do testing for 350 retailers, manufacturers and brands worldwide, including Nike, and we work with manufacturing partners in 46 states. We can do just about anything, from 3-D modeling and printing to in-plant auditing to applied R&D, and we conduct structural, antimicrobial and flammability testing. I take the most calls about hosiery and textiles. Mostly, we work with inventors and entrepreneurs who need help developing their product to get it mill-ready, or at a stage where they can talk to a manufacturer about production. Whether we prototype or the manufacturer does it, we want entrepreneurs to get it done as quickly and inexpensively as possible. We also do preproduction testing. For children's products, for example, there are certain safety tests that have to be conducted. Performance products often require testing related to wicking or moisture movement. We had a guy come in with a plan to make custom-fitted dress shirts, and we worked on a project a few years ago to create socks out of corn. We've worked to bring orders for men's dress socks back from overseas. How can 'treps increase their odds of success? They must have an idea fleshed out fully and know what they want to make and out of what materials before approaching a manufacturer. Manufacturers look to us to prescreen potential customers, and we try to make the process as painless as possible for both manufacturers and entrepreneurs. Manufacturers don't want ideas; they want orders. All of our services intermesh quite a bit. Why is it hard to find qualified domestic manufacturers? Manufacturers aren't always good at communicating and conveying what they do. Entrepreneurs need to be able to find a website, a Facebook page. No one searches through the phone book anymore. We work with manufacturers to increase their exposure and reach to those who need them. What are some other ways MSC helps bridge the gap between ideas and production? We know manufacturers; we've worked with them for decades. We can help entrepreneurs find who and what they need. We also have an on-site incubator where inventors and designers can develop their ideas. It's a big open space; they can nab anywhere from 500 to 2,000 square feet and use our equipment, our technology and our connections. Our full-time staff, all highly skilled people from the manufacturing world, will be happy to talk about some of the mistakes they've made and how to avoid the same.